The Waiting Room, ready to go! Let’s be frank here: the 70s was a weird time to watch TV. Actually, let’s back that up a bit: the 70s was just a weird time entirely. If you grew up during the 70s and 80s, you’ll know exactly what this means. For a start, there was the patina of grime and decay that hovered over so much of your everyday life, particularly if you lived in the industrial north. Your built environment was mostly either crumbling old buildings that had survived the war (to varying degrees), or the brutalist concrete that had initially promised to be so white and pristine, but had quickly turned into the grey, looming sullen hulks that surrounded us. Then there was the constant air of menace, a simmering undertow of everyday violence and atavism, and a vague, unsettling feeling that underneath the quotidian routine of “normal” life there was a world that “they” weren’t telling you about. And “they” were your parents, your teachers, the adults who surrounded you. It was a pretty paranoid time if we’re being honest, but then for most of it we did (not unreasonably, as it happens) think we were about to be obliterated in a nuclear exchange that would wipe around 90% of the human race off the face of the earth. Clearly there are a lot of us of a certain age who remember it in Eaglescliffe tonight, because the venue was heaving. 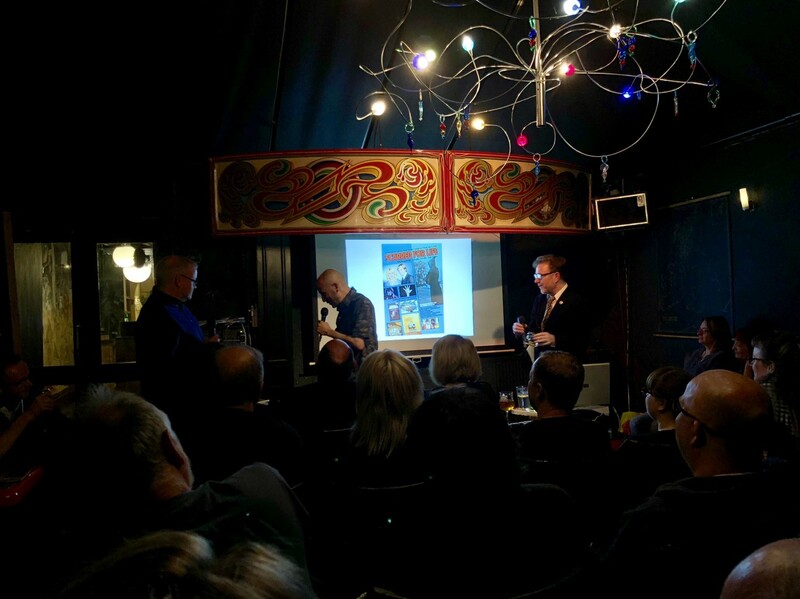 We’ve all made the journey to see Steve Brotherstone and Dave Lawrence talk about their book, Scarred For Life, which is a collection of essays about that strangeness. The evening is hosted by BBC Tees’ resident arty ponce, and writer around related subjects, Bob Fischer, who does a sterling job, despite (or possibly because of) looking like an archetypical trendy English teacher, complete with authentic period tie and jacket. And beard. There are several things that distinguish the TV of the era, perhaps. The first is that World War II was not some distant, abstract historical curiosity(1). It was still etched deep in many people’s minds as a vividly live memory. Our parents had grown up during the time, and their parents (some of whom were very much still around) had fought. It was still living history in a way it isn’t quite any longer. And many of those people had come home and were trying to work through those experiences, with varying degrees of success. Many of them wrote, or made films, or television. And some of it was for children. In some ways, the “child” part sometimes felt incidental. In series like The Changes, based on Peter Dickinson’s trilogy of novels, the main female protagonist just happens to be a young girl. She could easily have been older (or an adult even), and it would have mattered little. Actually, if she had been older, you’d have ended up with a show very much like the more explicitly adult Survivors. But this was a show that turned up at teatime in 1975; a show that talked about fear of technological change, the undercurrents of race, and the first painful steps that a newer, more diverse society was taking. It’s hard to believe a simialar kind of series could ever be made today. The same goes for serials like The Owl Service, or Children of the Stones, which quite apart from anything else had undercurrents of simmering adolescent sexuality that many would find quite deeply uncomfortable now now we’ve been through Savile. There was certainly a more pronounced interest in matters of the occult(2), so it wasn’t uncommon for shows like Arthur C Clarke’s Mysetrious World, or Uri Geller’s appearances on mainstream TV to keep such things in the public consciousness. And that seeped pretty much everywhere, which is probably another reason why things sometimes had a much more liminal air. Doctor Who, of course, was one of the great sources of this, deliberately placing otherworldly and sinister elements into everyday situations, generally as a way of putting the willies up kids. Very successfully as it turned out. All of this clashed with the onrushing pace of science and technology. Perhaps the culture was just in spasm as a result of the fear that the world was changing too quickly for many people to cope with it comfortably. Quite apart from anything else, adults were not frightened of scaring children, and perhaps this was no bad thing. The confines of TV gave children a ready supply of “safe” frights, and was perhaps preferable to the sometimes rather more brutish world that existed outside their own front doors. Most 70s nostalgia has problems grappling with an all-too-easy descent into platform shoes and Spangles, but it was a complicated time. Society was in frequent paroxysms. The idealism of the 60s had dissipated as the outside world intruded into the hopeful dreams some had left the 60s with. On the other hand, even with the economic woes of the period, many more people were in full employment, and as kids we had an expectation that our lives would be better than those of our parents and grandparents. Our televison experience was different from now, a smaller number of channels, rather ironically providing a wider range of fare than now, when despite having more “choice” than ever before, we are alogrithmically channeled into ever narrower vistas. Children’s TV was a specialism, and schedules (especially on the BBC) were designed to provide children’s equivalents of programmes in the adult schedule, from news to drama to comedy, to give a full breadth of coverage. As a kid, I had only three channels to watch, but those channels included shows and performers like Monty Python, Spike Milligan, James Burke, Play For Today, and Stanley Baxter, and then all the kids stuff on top of it. I was positively encouraged to watch a variety of TV, and it probably explains a lot about who I am, what I know about the world, and how I see it. All of this and more was discussed during the evening, including talking about the defining role of the Public Information Film, to the way comics like Action repurposed movie culture that many of its readers had no other access to because they were simply too young. It was a fascinating, thought-provoking and frequently funny evening. The authors have promised another journey up this way next year when volume 2, covering the 80s, is published. I very much hope to be there. (1) If you think for just a couple of seconds, you realise we are now further from 1980 than 1980 was from the start of the war. (2) At the time, some people put this down to a feeling of fin de siècle discomfort as we were approaching the millennium, even from that distant point. Now it seems like a more disturbing tendency was starting to take hold, a very noticeable turn from rationalism.